I am developing apps with Unity 3D, and often have several instances of the program open. 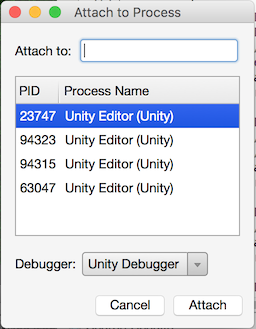 When I go to debug my scripts, Monodevelop (the script editing and debugger tool) shows me a list of all open Unity applications and their Process Identifiers (PIDs), so that I can choose which one to attach to. Unfortunately, I often have no idea which PID belongs to the instance of Unity that is running the scripts I wish to debug. put the PID in the title bar of the application? see the PID and text on the window's title bar, in some helper application? select an application by PID an bring it to the foreground? Browse other questions tagged terminal applescript . How to get the PID of every window of every process?